I am feeling so blessed today, and so grateful. Things have been going better than I have any right to hope for. For me, this is an amazing feeling - and anyone who reads this who also suffers from depression will know just what I mean. This morning I went out and snipped a bloom off of my lilac bush, and deposited it in a little tiny candle holder by my beading space so that I can smell it and see it while I blog and bead. Lilacs were my Mother's favorite flower and they always make me think of her... today that doesn't make me grieve or feel sad. It's more like a tiny hug from Mom. I've been reading a lot lately, and that is also a legacy from her; she was an English teacher (sorry about any grammar mistakes - they're definitely NOT inherited) and introduced me to a life long love of reading. 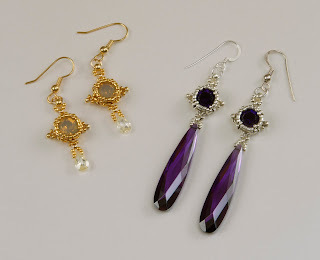 I've been a busy little bee, I've made three sets of earrings - unheard of for me, as I rarely make earrings - and made a tutorial for one set, finished a looooong awaited UFO, have made a few sales, and have been raking my yard like crazy. Autumn in NE leaves some BIG piles of leaves behind, and if you don't get them in the fall, you'll be working like mad in the spring. Guess who didn't rake this fall?? And it's been very hard to grab the seconds of sunshine in order to rake them, as well - today is the eighth day in a row with rain. But when I have had the chance to be out there, it's been wonderful, and just cool enough so that the work doesn't seem so much like work. And Spring is doing it's job, despite the rain; my friends on FB seem to all be perking up, sounding more like themselves, and excited over their work and play. My dogs are also waking up from the sleepy winter, and have been playing and chasing each other, and having a lovely time (LOL) in their baths. I am not so much looking forward to spring cleaning, but I know it's coming on. My husband has picked up his former career (on the side of his regular job) and is photographing again, and I am sooooo happy for him. He loves photography more than most anything (but genealogy), and his excitement and happiness to be doing what he loves again is another thing to be thankful for. He's had a very rough couple of years with incredibly intense and debilitating headaches, and this year they have eased a little, allowing him to enjoy things again. 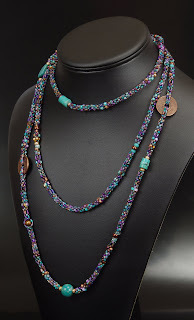 The Bead Mavens have been on hiatus - but still busy, and still blogging every week with a free tutorial. The rest seems to have done us all good, and given us more energy and creativity than we had before, and the ideas are brewing for what we'll be doing next. Almost everyone has come up with new tutorials and patterns for their shops (even me!!!! ), and I thought I would share a few of my favorites, in case you all have missed one or two. 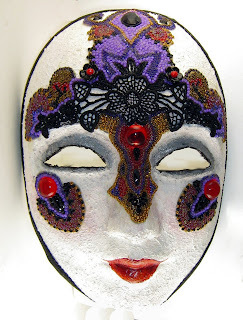 Linda has been creating the most awe inspiring art, and I have to share a little of that, too. Onward, to links and pictures!! Mikki has come up with beautiful beaded snap closures for beadwork, and made a tutorial of them. I think these are the coolest and cleverest snaps. If you'd like to make them, you can find them here. 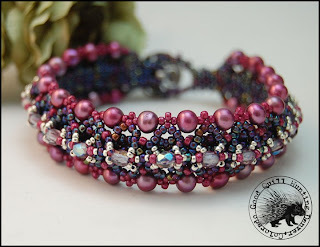 Christina's new bracelet pattern is one I really love, too, it's called Bridging the Gaps, and it's new on her website. 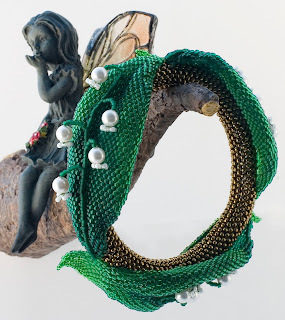 Cynthia's Fairy Ladder Bangle was created for the Vernal Visions challenge, and she has a tutorial for it on her Artfire shop. What a wonderful thing to share the making of such a beauty. 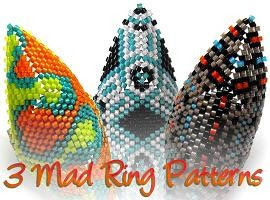 Heather's Mad Rings 3 in 1 Tutorial is selling like mad - and I know why, they're magnificent. 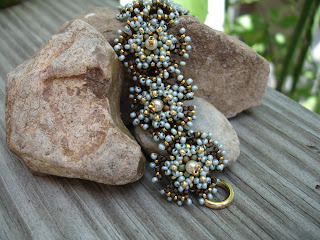 Callie has a new tutorial as well, for a delicate and lacy bracelet called Lotus Flower. Linda's new work just blows my mind as always. I'll let it speak for itself. 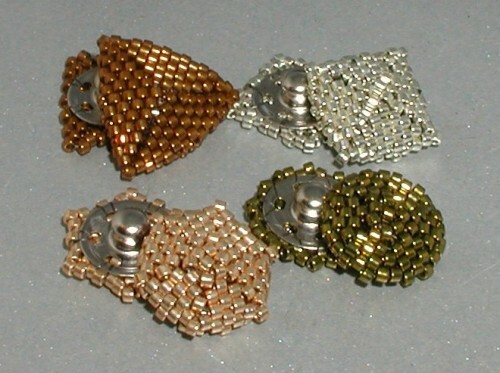 And my new tutorial is for my Lila Earrings, and if you'd like to make a pair, you can find the pattern here. I hope that everyone has some time today where they can feel some of the beauty in the world around them. Thanks for stopping by, and reading my ramblings! Hurrah for Spring! Thank you for sharing so many beautiful things. You sound so happy Nancy....and that makes my heart sing :) Great blog! I found my beauty for the day right here. Thank you, Nancy! You are simply amazing, and I love you. Thanks for making me smile with your wonderful words and light. There is much joy to be found in the simple things of life. Thank you for sharing yours! I enjoyed reading your blog Nancy. I'm so glad you're feeling better, and your work is stunning! What a wonderful blog post, Nancy! Thanks for sharing these positive and heartfelt thoughts with us. And also the photos of your stunning creations - Draconia is amazing! I just love, love the earrings!! And Draconia is WONDERFUL!!!! Glad your hubby is enjoying his hobby again too. Everyone needs a hobby or job they love!! I'm with you Nancy. Nature is a majestic and healing force. it's great to be able to step outside into the glory. Those earrings look awesome. Gotta go back and have a closer look! Great to hear you sounding so happy, Ned. Congratulations on the sales, too! It's nice to hear things are picking up for you. 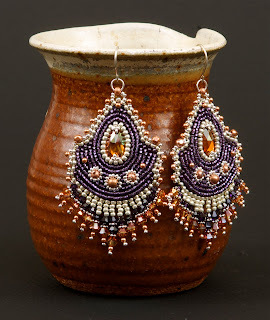 I love everything you have shared but I especially love your untitled earrings (the first pair)... will you be releasing a tutorial for these as I'd love to make a pair! I simply LOVE those Untitled Earrings!!! Your words make me feel even closer to you and I feel blessed to be a friend of yours. I hope things will continue to go like this. Hugs.